This was perhaps my favorite photograph from the nearly 300 that I took on my recent trip to Bicol. Photography is not my forte, and my hands have such strong tremors that many of my photos come out blurred, and are often instantly deleted. Perhaps I simply have a bias towards pako, or the unfurling (or unfurled in the case of wester fiddlehead ferns) young stems of a fern, but the excitement of finding them in their natural state and capturing it in this manner really made my day. By the roadside, under coconut trees, in low underbrush, these ferns thrive, particularly during the rainy months and they are free for all to just pick and savor… The biggest pain in the neck is having to patiently harvest them and get enough for a small salad… it would take me hours to do that! I have written about fiddlehead ferns or pako before, here, used them in a fusion menu here, and purchased them at the markets, here. 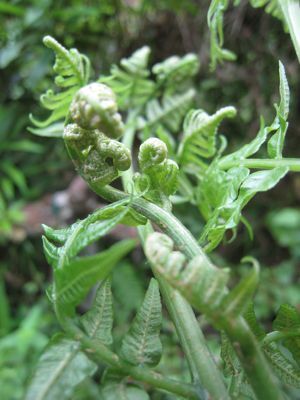 In the wild, they look like some of the more common garden ferns… they grow like weeds and you just have to look closely to find the new tips unfurling. 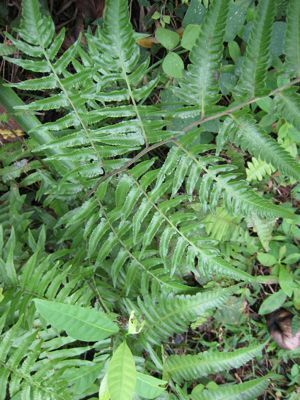 If you follow some of the links to earlier posts above, you will see that the name, pako, which I thought was ours alone, is derived from the Malay word paku, which refers to several kinds of edible ferns in Malaysia and Indonesia, where they also like to eat this delicacy. The best way to enjoy pako, in my opinion? In a chilled salad with tomatoes and a light vinaigrette… superb! i love pako in sinigang and also the pako salad from kusina salud. you do take gorgeous pictures all the time.love them. yep, this makes a really great salad, and you could play a bit and add citrus segments or white cheese. . . but nothing beats the ilocano way with bagoong kamatis and lasona (onions) . . .
You are a self-accomplished photographer! You take pictures well look at these humble ferns they look alive in pictures. Pako is good in bangus sinigang sa bayabas and chilled in salad with marinated in vinegar and grilled pork chops and liempo and fried fish or salad with generous amount of vinaigrette with veggies or coconut ubod fried lumpia and deep the fried lumpia in the vinaigrette. I love pako salad. We include pako with our ginataang suso(small snails). Yum! Yum! My dad makes pako salad like his mom did: blanched then shocked, chilled in the fridge then tossed in bagoong Pangasinan (his parents are from there), diced (chilled and de-seeded) tomatoes, finely minced sibuyas tagalog and a squeeze of dayap. Served with inihaw na bangus or liempo and heaps of steamed white rice. Aside from vinegar, tomatoes, onion and “luya”, add some cubed boiled egg. Nice! O yeah, pako with ginataang suso ( Tayabas, Quezon), add some extra siling labuyo .Man! Fresh ones too, blanched, shocked, add sardinas and onions or jumping small hipon. I wanted to try this with some sashimi, hmmmmmm? Whadya guys think? I think you underrate your photography skills! I love pako and have always wondered if I could grow it here in manila. Pako with tomatoes, red eggs and a very light vinaigrette – that’s the best. My mom makes that, and when she does I really can’t help but eat a lot. Wow! I LEARNED a LOT from your readers!!! I’ve never made this at home but with a lot of researching from your blog and from this current post I’m more inspired to make it this weekend! I have never had “pako” and looking at your pictures, I thought … hey, I have those in my garden! I did a Google search on “edible ferns” just to make sure. MM …. I suggest that you warn your readers that there are look-alike varieties of ferns that are known to have cancer-causing chemicals in them and are therefore not recommended for consumption. Most websites mention that only Ostrich Ferns are edible. I do not mean to scare people from eating “pako” but I think we need to be careful though. i love pako, when we were small we used to gather them along the riverbanks of Bolbok river, we bring along a small basin of clothes to wash and eat our lunch there with galunggong cooked in kamatis and of course the pako plus bagoong balayan and kalamansi, my best friend’s nanay from Nagcarlan cooks tortang pako for breakfast, it was so abundant in Laguna. I had pako with coconut milk and snails (the one with the triangular tip) during a meal in a Bicolano restaurant. Sarap. If you don’t have access to hand-pick fiddleheads or aren’t entirely sure if you’re picking the correct plant – my company, marxfoods.com will be selling them (as soon as they come into season in about a week) direct from coastal foragers in Northern CA up through WA. Of course, it must be ginataang pako plus pritong isda, yummy! Bicolana ini! i prepare pako mostly salad with vinegar and sugar, itlog maalat & tomatoes & onions.. but lately i tried stir fried with tofu and oyster sauce.. sosie! thanks for the tips.. puede pala ginataan and sahog sa sinigang.. just like fresh mushrooms put them anywhere.. eat them anyhow..
my brother eat almost everything raw- imagine eating raw okra and sitaw (the thin ones, yung wala pa masyadong buto) careful though with those that have been sprayed. The first time I tasted pako was only when I was already here in Manila. I have a suki in a nearby talipapa who ocassionally sells pako from Laguna. A bundle cost 10 pesos. I usually cook it in gata (being a Bicolano, my husband likes it spicy) and hipon or sugpo which I also bought fresh from talipapa. Normally, after the gata has boiled and shirmps were cooked that the time when I put the pako leaves because cooking them for a long time would lost their crispiness. then I stumbled upon this on the Net. Oh my. There’s always a downside. I love Pako in fact I have an organic pako farm in the city of san fernando here in pampanga. I want to study this crop so that we can know what are the other uses of this plant. And I just want to add that here in pampanga pako are abundant. And ensaladang pako or fern salad is very great food.